Ashford House is a bright, colourful, purpose-built care home in Surrey, providing single rooms with en-suite bathrooms for all its residents. The home is situated on the outskirts of Stanwell near Staines, in quiet surroundings but not far from the M25. The home offer 24-hour nursing care to people living with dementia. Ashford House works hard to ensure that a wide range of mentally and physically stimulating activities are available to residents, including work on life boxes (reminiscence aids and reminders of life history), sessions with daily newspapers, puzzles, cooking and baking, accessing the garden and summer house, visits from ‘Pets as Therapy’ dogs, reminiscence work based on objects of interest and spending time listening and dancing to music. We are proud of the elderly care we offer to people living with dementia at our nursing home and we like to help if we can. We welcome visitors and callers! 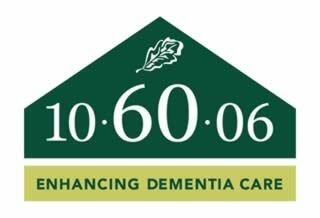 We are proud to be one of the first care homes to be accredited as part of Barchester’s 10-60-06 Dementia Care Programme, reflecting the enhanced quality of dementia care and improved quality of life experienced by residents here at Ashford House. Hi, my name is Julia and I am the General Manager here at Ashford House. Welcome to our website! I started working part time as a carer in a local care home when I was 16 whilst finishing my studies. At 18, I left home to start my nursing career and, after qualifying as a registered nurse, I went on to midwifery. After having 2 children,I found working in the NHS difficult to manage and had an opportunity to go back to working in care homes. I got my first management position in 1998 and have never looked back. It is so rewarding to do a job that I enjoy and that I am passionate about. I have been part of the Ashford House team for a long time now and I am enjoying using my skills and experience in nursing to care for the residents. I have been a nurse for over 15 years, starting in the Philippines, and have continued to develop my skills since moving to the UK. I am happily married with a son and I feel privileged to be able to work in a job I feel passionate about. I joined Ashford House in 2009 as a Junior Nurse. Thanks to my mentor, I was promoted to the Head of Unit for our Chestnut and Haleham units. My role also comprises the mentoring of my junior colleagues to ensure that we can provide high standards of care to those we support. As a Head of Unit, I make sure that show rooms are kept presentable for visitors. Whilst at Barchester, I have been given many opportunities to take courses, including a leadership course, which has helped me improve the quality of my work. I am a proud nurse and I will always endeavour to provide a high standard of care to residents of Ashford House. Hi, my name is Neelam and I am the Finance Administrator here at Ashford House. My favourite part about this role is how challenging it can be - and I love challenges! Sean started at Ashford House as a volunteer, as he required 6 weeks work experience for a course at college. During these 6 weeks it became apparent that Sean had a real talent for working in this environment. Sean showed compassion and respect to all residents instantly. After Sean completed his work experience he was offered a position as the Activities assistant. 6 months later Sean now is a valued member of the department and the Ashford House Team, he delivers meaningful activities and supports the residents with all their needs and choices. I started at Ashford House as a Care Assistant, but quickly became interested in activities, assuming the position of Activities Coordinator in May 2017. Sharon has been Head Chef here at Ashford House for just over a year now. As Head chef, Sharon has many responsibilities, which include providing nutritious meals for residents, making sure that meals look presentable and appetising, managing the budget for the kitchen and supporting special events, such as holidays and residents' birthdays. Alongside all of that, Sharon aims to always use seasonal fresh produce and cater for the needs and desires of those we support. Sandra is our Second chef here at Ashford House. She supports the aims and objectives of the kitchen to provide residents with tasty and nutritious meals. As well as supporting the Head Chef, Sandra is a keen baker and will offer support to residents who are competing in annual Barchester events, such as the Easter cake making or the Christmas cake design competition. Linda has worked in Ashford House since 2010. She first joined as a Care Assistant, but was offered the position of Head Housekeeper in June 2015. Since then, Linda has been a dedicated member of staff, always upholding excellent standards throughout the home. Linda is responsible for ensuring that the laundry and domestic departments run smoothly, providing an outstanding service for everyone we support. Alongside this, she and her team maintain our show rooms to an incredible standard and prepare rooms for new residents, making them as homely and welcoming as possible.